Cambridge win both the men's and women's Boat Races for the second year in a row. Jason Bell v Sam Quek: How hard is it to compete in the Boat Race? Former NFL star Jason Bell and GB Olympic gold medal winning hockey player Sam Quek put themselves to the test to see if they would have what it takes to compete in the Boat Race. Video caption: 2019 Boat Races: Could Jason Bell & Sam Quek hack it as a racer?2019 Boat Races: Could Jason Bell & Sam Quek hack it as a racer? Cambridge won both the men's and women's races last year, taking the men's race by three lengths, meaning they hold a 83-80 lead over their rivals in the event's history. There is a bigger gap in the women's head-to-head - with Cambridge leading 43-30 - but Oxford will hope to narrow the gap this year. 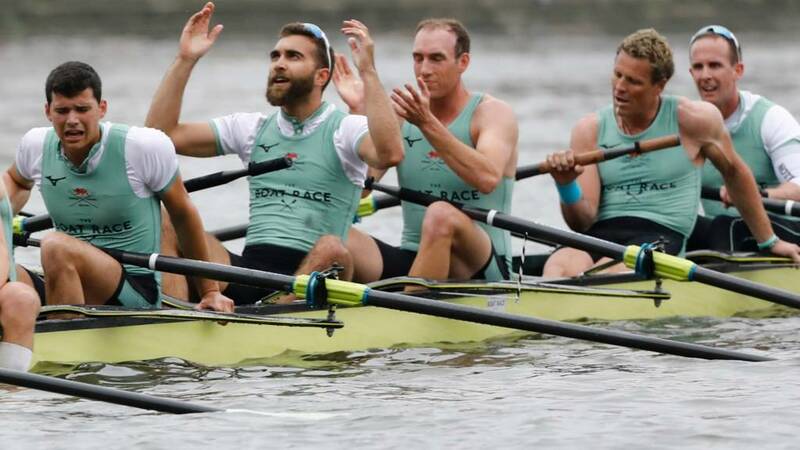 More than 250,000 people are expected to take to the banks of the River Thames to watch the two teams compete - making this one of the biggest spectator events of the British sporting calendar. Two-time Olympic champion James Cracknell is set to become the oldest person to compete in the Boat Race. The crews are being announced on Thursday and Cracknell, 46, is set to be named in the Cambridge boat for the iconic race on 7 April. Cracknell retired from elite rowing in 2006 but qualifies because he is studying a Master of Philosophy degree in human evolution at the University. He won gold in the coxless fours at both the 2000 and 2004 Olympic Games. The BBC has live coverage of both the women's and men's races as Oxford and Cambridge lock horns on Sunday, 7 April. The Boat Race, an annual rowing contest between crews from Oxford and Cambridge University Boat clubs, features a women's race at 14:15 BST and a men's race at 15:15 BST. Live coverage of the both races will be available on BBC One, Connected TV and online, with updates on Radio 5 Live. You will be able watch coverage back on the iPlayer. A whole generation of Brits grew up watching our rowers dominate the Olympics, with Sir Steve Redgrave and Sir Matthew Pinsent leading the medal tallies. Whether you wish to emulate the success of the GB rowing team, or just burn a few calories out, rowing is an easy to enjoy sport for all. There is a wide range of ways for people of all abilities to take part in rowing, including personal challenges, indoor rowing, ocean crossings, regattas and international competitions. 1. Visit British Rowing - or find local rowing opportunities in Ireland, Scotland and Wales. 2. Share your story and inspire others.